This brooch is about trying to open up to someone, but instead presenting a facade and retreating inward. 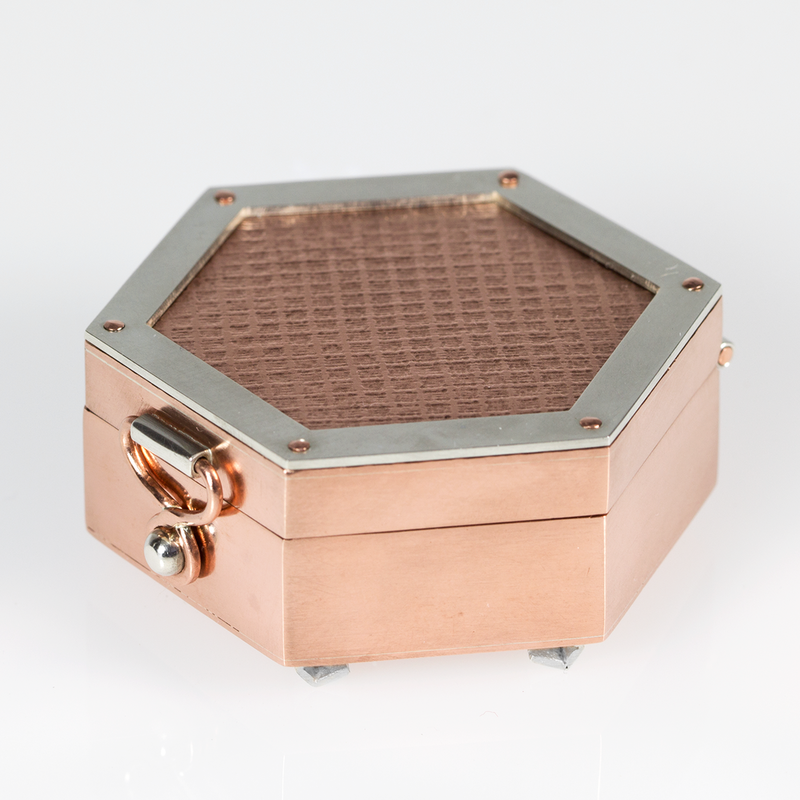 Formally, it is a thick hexagon with several geometric features present throughout: the front face has a gridded texture surrounded by a silver rim which is secured by rivets, the hinges and catch are plain and utilitarian in nature, and the sides are comprised of clean edges with sharp corners. These formal qualities add up to an outward appearance of something which is tough, imposing, and secure—mirroring the hard, neutral exterior that I attempt to maintain around people. The brooch can be opened to reveal a soft, and cutesy interior: the inside of the lid is embossed with a lace pattern and the texture of a soft fabric. 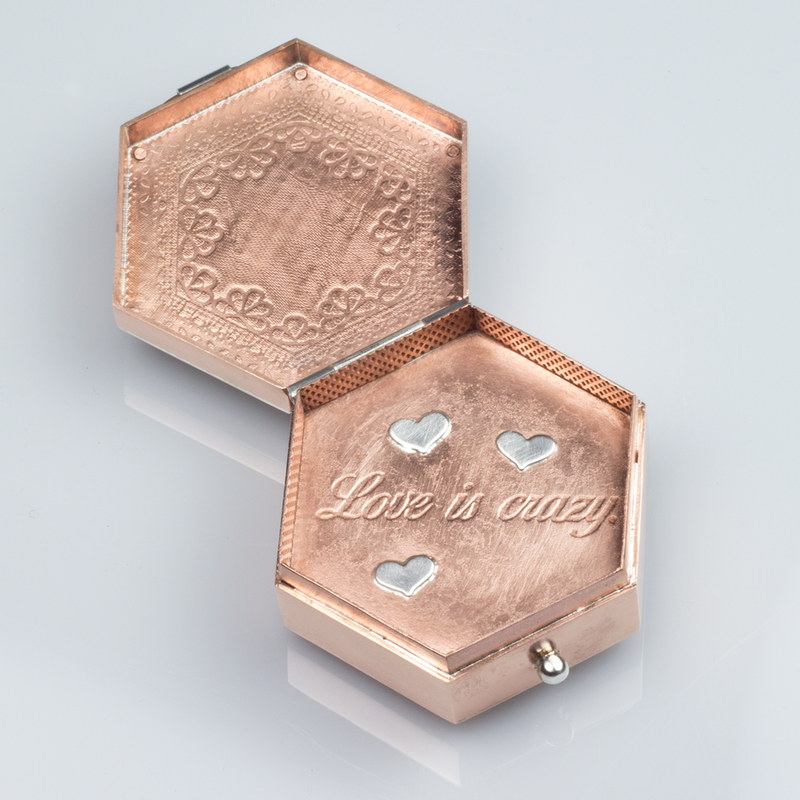 The inside of the brooch itself has a disheveled look with the words “Love is crazy” betwixt several cartoonish silver hearts and textured walls. This is a tongue and cheek way of alluding to both the sinister secrets that this box holds, and my issues with anxiety, depression, and trust. Taking the brooch off the body and viewing it from the back reveals a hexagonal shaped hole that faces the wearer, revealing a small chamber covered in writing.